Oils used to standardize EZ Cups are produced in accordance with ISO/IEC 17025, ISO Guide 34, ISO 9001. The EZ Cup formula for each cup of the series matches the applicable ASTM formula in D4212 at the recommended calibration level. EZ Cups are compatible to ASTM D1084 Viscosity of Adhesives and ASTM D816. 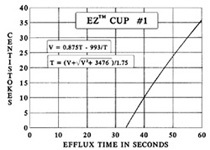 Conversion table relating efflux time in seconds, to the nearest tenth of a second, to viscosity in centistokes furnished with each EZ™ Cup. EZ Cup calibration is traceable to the National Institute of Standards and Technology. Calibration and Certification procedures qualify under ANSI/NCSL Z540 or MIL- STD- 45662A as applicable. The EZ Cup is not matched by any other cup of its type, either with respect to the advantages listed above, in highest quality of workmanship or in continuing quality control procedures. All stainless steel cup and handle. The finest, most reliable, calibrated & documented cup on the market. EZ Cup orifices are machined rather than drilled to insure exact centering in the cup hemisphere base and a minimum of burr formation. This insures an orifice of specified length and a correct symmetrical efflux stream. The EZ Cup support rods are offset from the side of the cup and secured to the cup sidewall below the cup rim. This eliminates errors due to test material drainage from support surfaces. The increased separation width of the support rods by over 20% and the lowering of weld to the cup provide best possible conditions for cleaning. ¹ Stated as centistokes per second of efflux time. The EZ Viscosity Cup Series is a logical and necessary outgrowth of the standardization studies on the Zahn Signature and similar cups for the promotion of this most popular type of viscosity measuring instrument as a national and international standard. 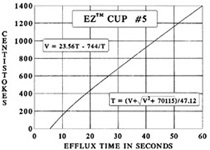 Not only has this cup been improved with respect to earlier produced cups and designed to comply to the requirements of ASTM D4212 but, in addition, each EZ Cup is furnished with a table which permits conversion between efflux time in seconds to the nearest tenth of a second to viscosity in centistokes. This table is particularly useful in determining efflux time in seconds when viscosity in centistokes is known. For those users who require documented certification of their measuring equipment, the EZ cups may be ordered, at an additional charge, with a CERTIFICATE of CALIBRATION . This document contains not only information on actual cup calibration with standard oils traceable to the National Institute of Standards and Technology but in addition, this certification also complies to conditions and procedures under the requirements of ANSI/NCSL Z54O or ISO/IEC 17025, ISO 9001 as applicable. The EZ cups are produced to very close mechanical tolerance in elaborate jigs and fixtures. Such equipment not only insures that each cup is correctly produced but also that all cups are identical. All parts of the cup are of stainless steel except for the name plate. The following table provides operating range specifications, cup midrange sensitivity and recommended calibrating oils. Following this table are graphs and mathematical formulas that relate efflux time in seconds to centistoke viscosity. The POISE is the fundamental unit of viscosity. It is a defined mechanical measurement of the resistance of a liquid to flow where gravity is not a factor. 100 CENTIPOISE = 1 POISE. However, gravity is the driving force causing liquid in a viscosity cup to flow through the orifice. A high density material will flow from a cup in a shorter time than a low density material of the same viscosity. The STOKE is defined as the POISE divided by density (or weight per gallon times 0.120). 100 CENTISTOKES = 1 STOKE. The CENTISTOKE is the unit of reference in all viscosity cup measurements. The graphs at the left of this page and on the preceding page relate viscosity in CENTISTOKES to efflux time in SECONDS for each of the five cups of the EZ™ series. The graphs may be used for determining the rough relationship between these factors but usually reference will be made to the table that is furnished with each EZ™ cup which gives the relationship to the nearest tenth second. If there is a necessity to determine the relationship beyond the range of the table, the mathematical formulas shown on the graphs may be used. The first of the formulas shown on the graph is used when efflux SECONDS is known. As an example assume 42.5 SECONDS in the No. 2 EZ™ Cup. Multiply 42.5 by 2.80 and the result is 119. Divide 747 by 42.5, which is 17.6 and subtract this value from 119. The result is 101, the CENTISTOKE value of 42.5 SECONDS efflux time from this cup. The second of the formulas shown on the graph is used when the CENTISTOKE value is known. As an example, assume 825 CENTISTOKES in the No 5 EZ™ Cup. Square 825, which is 680625 and add 70115 for a total of 750740. Take the square root of this value, which is 866 and add 825 for a total of 1691. Divide 1691 by 47.12 and the result is 35.90 SECONDS, the efflux time value of 825 CENTISTOKES from this cup. Select the proper number cup to be used from the Specification Table, which is dependent on the expected viscosity range of the material to be measured. Insure that the cup is clean and that there is no residual dried material in or around the orifice. Adjust the temperature, if necessary, of the test material. Completely immerse the cup into the material to be measured in a location free from bubbles or foam, holding the cup vertically by means of the stainless steel split key ring. Measure and record the temperature of the material that is encompassed by the cup. Hold cup vertically by inserting index finger into handle ring. In a quick, steady motion, lift the cup out of the sample material, starting the timer when the top edge of the cup breaks the surface. During the flow time, hold the cup no more than 6” above the level of the sample material. Stop the timer when the first definite break in the stream at the base of the cup is observed. EZ™ viscosity cups are ruggedly constructed with all parts made of stainless steel, except the nameplate, and will give many years of satisfactory service requiring only thorough cleaning after each use. It is recommended, however, that calibration of the cup be confirmed periodically, or if dropped or otherwise subjected to damage, with the appropriate standard oil selected from the specification table. The listed viscosity value of these oils as shown on the container label is traceable to the National Institute of Standards and Technology. Flow characteristics of the EZ™ Dip Viscosity Cups are very accurately defined by mathematical formula relating them to the viscosity of standard oils which are traceable to the National Institute of Standards and Technology. The formula for each cup in the series is shown on the cup graphs of prior pages. For convenience, the formula for each cup has been solved for each tenth second within the normal cup range. Results are available in table form as shown above and are furnished with each cup. They are also available in sets of five for the five cup series. Use the table as follows: Assume an efflux time of 45.6 seconds. Read down the left column to the 45.0 line and then to the right on this line to the 0.6 column. The value at the intersection is 111.3 centistokes. 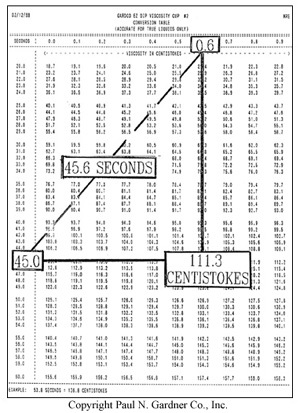 The tables may be read in reverse to find efflux time in seconds from a known centistoke value. Most materials change in viscosity as a function of temperature. Those normally measured with viscosity cups change in the range of 3% to 8% per degree Celsius change in temperature. Usually, the higher the viscosity the greater the change. For acceptable accuracy it is necessary to measure temperature at the same time that viscosity cup readings are taken. When many determinations are to be made on similar products in the same viscosity range, it may be helpful to produce a graph for converting measured temperature and viscosity cup efflux time in seconds to seconds at a specified temperature, normally 25° Celsius. There are three variables to consider: viscosity, efflux time and temperature. All three can be shown on a graph with a family of curves as shown in the following example. Viscosity level is indicated by the diagonal lines, increasing from the lower right to the upper left. 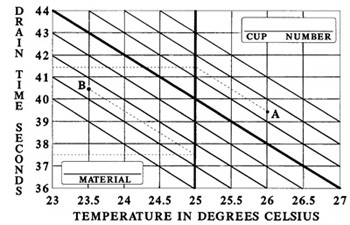 Such a graph can be prepared for a given material by taking readings with the EZ™ cup over a limited temperature range as shown in the example. Within this limited range the plots of the obtained data will normally result in a straight line such as the heavy diagonal line. Draw parallel lines as shown which represent different viscosity levels. Enter on the graph the material represented and the EZ™ designation with cup number. Use the prepared graph by plotting on it measured temperature and efflux time in seconds. At "A" in the example these values are 26.0°C and 39.5 seconds. Read parallel to the diagonal lines to the intersection with the heavy vertical line which is 25.0°C, the target temperature. Reading horizontally to the left it is found that the corrected efflux time in seconds at 25°C is 41.5 seconds. Similarly, at "B" in the example, it is found that a reading taken at 23.5°C, when corrected to 25.0°C changes from 40.5 to 37.5 seconds. Compensating for a measured temperature near to, but not as specified, must be with caution. Even within the limited range of ±2.0°C the variation of the viscosity with temperature may not be truly linear and any thinning materials used to adjust viscosity may also change the rate of this variation. Warning: Silicone fluids should not be used to calibrate viscosity cups. These materials change the interface between the cup surface and the test material and therefore change the cup calibration. The following is taken from ASTM D445: Viscometers used for silicone fluids should be reserved for the exclusive use of such fluids. 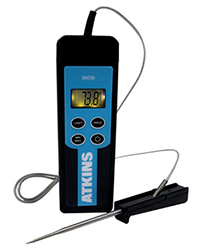 Solvent washings from these viscometers should not be used for cleaning other viscometers. Gardco produced viscosity cups are calibrated with standard “G” series oils. These standard calibration oils prepared expressly by the Cannon Instrument Company for the Paul N. Gardner Company are produced in accordance with ISO/IEC 17025, ISO Guide 34, ISO 9001. Centistokes viscosity of these oils is traceable to the National Institute of Standards and Technology. These oils are available from the Paul N. Gardner Company. 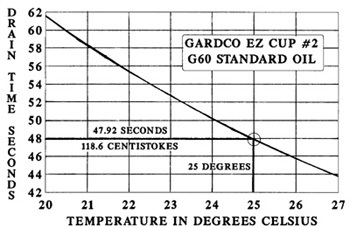 Shown in the graph is the viscosity cup number and the standard “G” oil used for its calibration. Normally, cup calibration is at 25 degrees Celsius, shown on the graph by bold lines intersecting with the curve in the circle. Graphs for all cups in the EZ series are included with each cup sold by Paul N. Gardner Company. Viscosity of most liquids, including the standard oils, are dependent on temperature. Efflux time in seconds for the indicated cup-oil combination from twenty (20) to twenty seven (27) degrees Celsius is shown in the graph. The cup may be checked with the indicated “G” oil with reasonable accuracy within these limits. For best accuracy, the temperature of the standard oil should be 25°C. The standard oil value in centistokes is printed on the standard oil bottle label. Conversion from viscosity to efflux time in seconds is by formula or table which defines the characteristics of the cup. The applicable formula and table are furnished with each cup sold as an additional customer service by the Paul N. Gardner Company and licensed distributors. Probe permanently attached by 29" high temperature wrap-around cable. Equivalent Charts cover Gardco Calibrated Viscosity Cups and are based on conversion formulas of a type & with parameters as referenced in The Encyclopedia of Polymer Science & Engineering (Vol. 4, Second Edition, John Wiley & Sons, Inc.). Standard oils traceable to the National Institute of Standards & Technology were used in experimental development of these formulas. Viscosity Cups are non-returnable items. Subject to final sale.